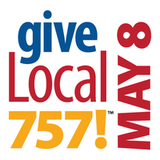 Support Co-op through GiveLocal757 on May 8! On May 8, your donation to Co-op can go more than double the distance when it qualifies the school to win a bevy of additional cash prizes through GiveLocal757’s one-day fundraising event. For one special 24-hour period, your gifts to local nonprofits through the www.givelocal757.org website will enter recipients to win additional monetary awards of up to $5,000. Make your $50 contribution to the Williamsburg Parent Cooperative Preschool online as soon as you wake up to help us win the Early Bird prize of $1,000. Donate as little as $10 between 5:00 – 6:00 p.m., and Co-Op can pocket an additional $757 Happy Hour prize. Donations must be made online to qualify for prizes. All gifts are 100% tax-deductible. Last year’s GiveLocal757 campaign was a tremendous success, netting the school in excess of $10,000 and funding much-needed playground improvements. This year’s proceeds will continue those improvements, ensuring that the Co-Op curriculum is ever-evolving. On the evening of May 8, celebrate the school and the legacy you’ve helped create at the GiveLocal757 fundraising bash from 5:00-7:00 p.m. at the Virginia Beer Company. Cheer on our remarkable community as we wait for the prizes to be announced. Pizza and drinks are included at this family-friendly gathering. The Williamsburg Parent Cooperative Preschool philosophy, “Learning Through Play,” guides the creation of an environment that allows children to teach themselves through exploration and discovery. Students gain confidence and competence, are self-motivated, practice listening skills, and love of learning for its own sake.